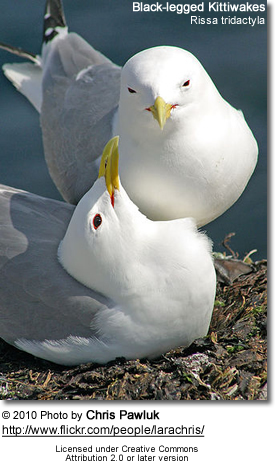 Thekittiwakes (genus Rissa) are two closely related seabird species in the gull family Laridae, the Black-legged Kittiwake (R. tridactyla) and the Red-legged Kittiwake (R. brevirostris). The epithets "Black-legged" and "Red-legged" are used to distinguish the two species in North America, but in Europe, where R. brevirostris is not found, the Black-legged Kittiwake is often known simply as Kittiwake, or more colloquially in some areas as Tickleass or Tickleace. The name is derived from its call, a shrill 'kittee-wa-aaake, kitte-wa-aaake'. 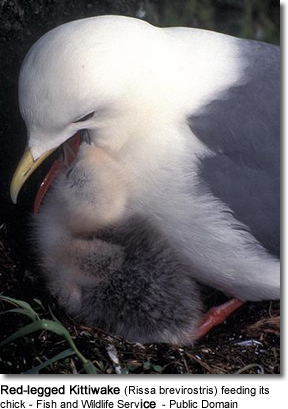 Kittiwakes are coastal breeding birds ranging in the North Pacific, North Atlantic and Arctic oceans. They form large, dense, noisy colonies during the summer reproductive period, often sharing habitat with murres. They are the only gull species that are exclusively cliff-nesting. The Black-legged Kittiwake is one of the most numerous of seabirds. Breeding colonies can be found in the Pacific from the Kuril Islands, around the coast of the Sea of Okhotsk throughout the Bering Sea and the Aleutian Islands to southeast Alaska, and in the Atlantic from the Gulf of St. Lawrence through Greenland and the coast of Ireland down to Portugal, as well as in the high Arctic islands. In the winter, the range extends further south and out to sea. 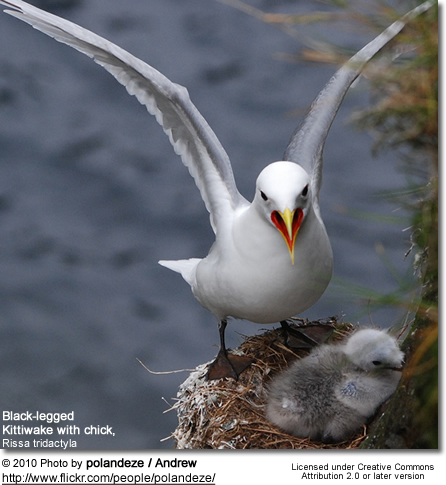 In sharp contrast, the Red-legged Kittiwake has a very limited range in the Bering Sea, breeding only on the Pribilof, Bogoslof and Buldir islands in the United States, and the Commander Islands in Russia. On these islands, it shares some of the same cliff habitat as the Black-legged Kittiwake, though there is some localized segregation between the species on given cliffs. The two species are physically very similar. They have a white head and body, grey back, grey wings tipped solid black and a yellow bill. Black-legged Kittiwake adults are somewhat larger (roughly 40 cm in length with a wingspan of 90-100 cm) than Red-legged Kittiwakes (35-40 cm in length with a wingspan around 84-90 cm). Other differences include a shorter bill, larger eyes, a larger, rounder head and darker grey wings in theRed-legged Kittiwake. While most Black-legged Kittiwakes do, indeed, have dark-grey legs, some have pinkish-grey to reddish legs, making colouration a somewhat unreliable identifying marker. 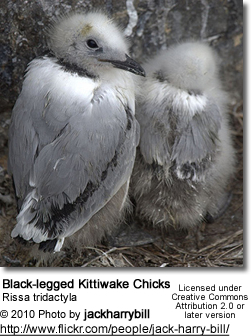 In contrast to the dappled chicks of other gull species, kittiwake chicks are downy and white since they are under relatively little threat of predation, as the nests are on extremely steep cliffs. Unlike other gull chicks which wander around as soon as they can walk, kittiwake chicks instinctively sit still in the nest to avoid falling off. Juveniles take three years to reach maturity. When in winter plumage, both birds have a dark grey smudge behind the eye and a grey hind-neck collar. The sexes are visually indistinguishable. (Russian) Artyukhin Yu.B. and V.N. Burkanov (1999). Sea birds and mammals of the Russian Far East: a Field Guide, ?oscow: ?S? Publishing – 215 p.
Tinbergen, Niko (1969).Curious Naturalists. Garden City, New York, USA: American Museum of Natural History. pp. 301.